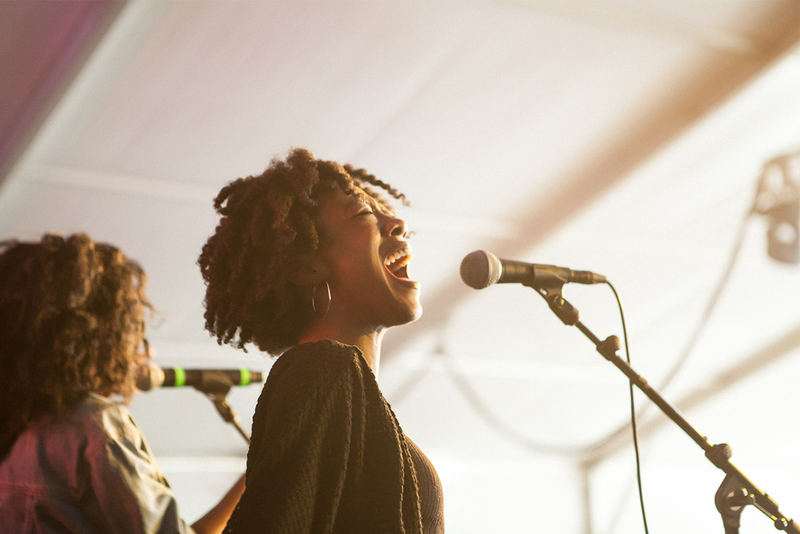 Refine your skills in Columbia College Chicago’s Music bachelor’s degree program, which focuses on contemporary, urban, and popular music. In core classes, you’ll learn theory, composition, improvisation, arranging, technology, history, analysis, and aural skills. You’ll enroll in private lessons for your primary instrument/voice and complete coursework designed to provide collaborative music-making experiences with students and faculty members. You’ll also gain performance experience in ensembles that play a variety of styles and genres. An audition for admission is not required, but Music Department faculty members will evaluate your music theory knowledge and performance skills before your first semester. The goal of this evaluation is to place you in the appropriate level of coursework. If you don’t have formal training, our curriculum will help you gain the knowledge and skills you will need to develop and refine your talents. If you do have formal training, we will place you in courses that will bring your musicianship to the next level. 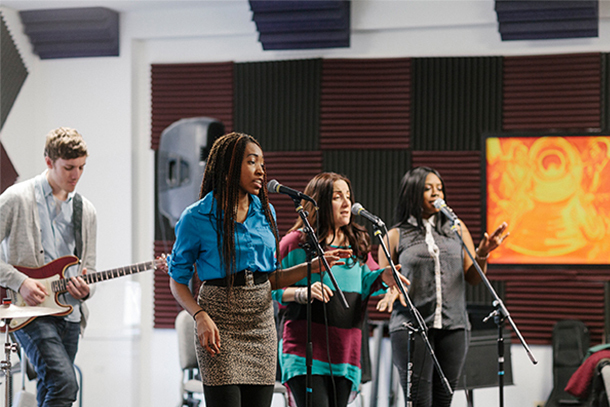 The Music Department at Columbia College Chicago offers three degrees in Music. The Bachelor of Arts (BA) degree is a 47-credit liberal arts degree that focuses on the performance and study of contemporary, urban, and popular music. The BA curriculum includes a number of electives that you can use to pick up a minor or a second major. All Columbia Music majors start out in the BA program their first year. If you want to prepare for a professional career in music performance or composition, or you think you might want to pursue graduate studies, you can apply to one of Columbia College Chicago’s two Bachelor of Music (BMus) programs. 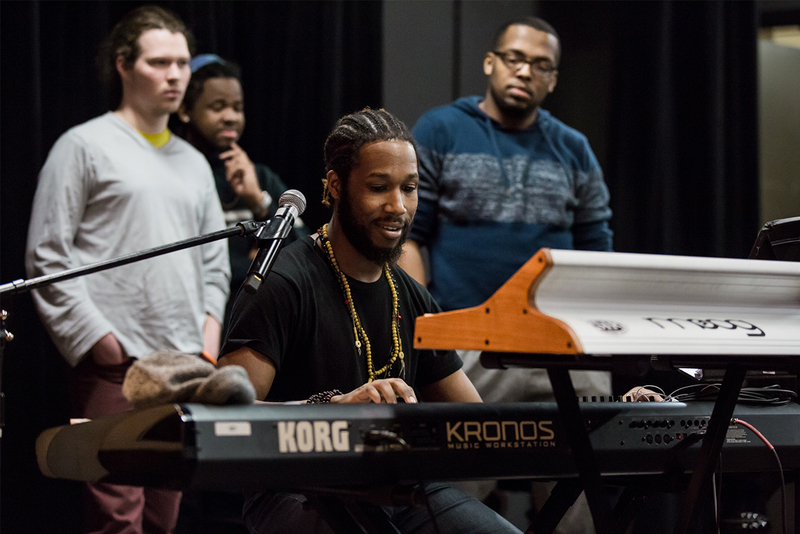 BMus programs include broader and more advanced coursework than the BA program, allowing you to go deeper into specialized areas of music, such as performance and music criticism. BMus degree programs, however, do not include enough elective credits for the completion of a minor. Acceptance into a BMus degree program is by application only. The process usually occurs during the second year of a student’s BA program. Learn more about our BMus programs. All Music majors (instrumentalists and vocalists in the BA and BMus programs) perform in ensembles as part of their coursework. You’ll gain skills and experience in collaborative music-making. We offer a wide range of ensemble courses in contemporary, urban, and popular styles. 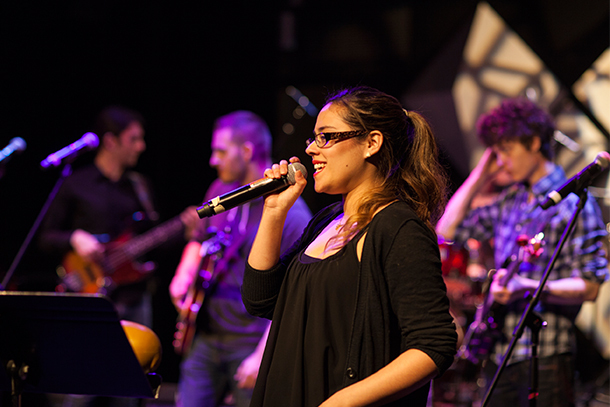 Genres covered in ensemble courses include pop, rock, jazz, R&B, fusion, and gospel. All ensembles are directed by our faculty of professional musicians. Columbia also has ensembles dedicated to creating original music, allowing you to gain experience in arranging, rehearsing, recording, and performing. As one of your degree requirements, you’ll take private lessons with faculty members who are experienced professional musicians. The lessons are available across a range of vocal and instrumental genres and styles. During this dedicated time with faculty members, you’ll master your performance skills and hone your distinctive sound. Chicago is a great place for students studying the performing arts. 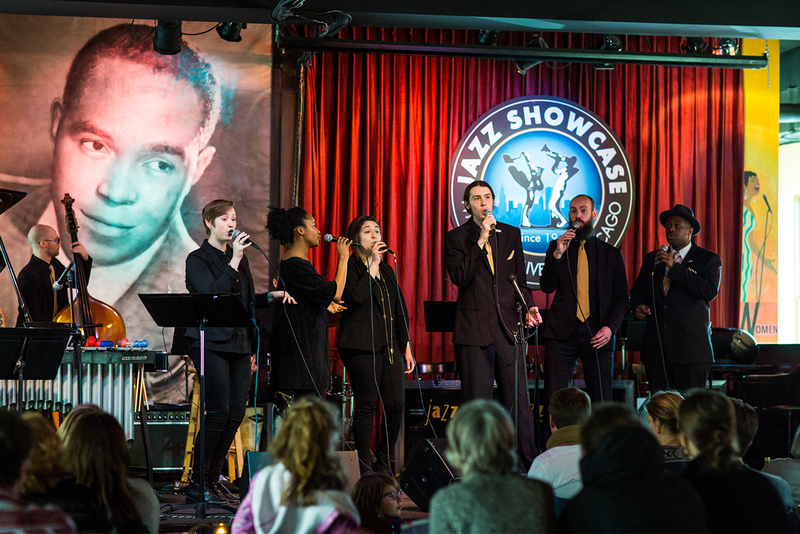 You’ll have many performance opportunities in a variety of settings, both on campus as part of your coursework and in Chicago’s vibrant music scene. Columbia’s Music Center hosts more than 200 student, faculty, and artist-in-residence performances and workshops each year. 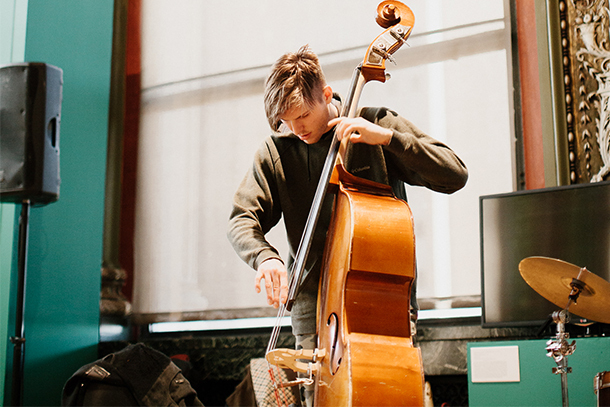 We bring professional musicians to Columbia College Chicago for week-long residencies every semester. You’ll study with these artists and perform with them on stage. They lead workshops and master classes with student ensembles. They also lead recording sessions and public performances. Through your interactions with them, you’ll gain valuable experience and insight into possible career paths. Some recent artists-in-residence include Grammy-winning, multi-instrumentalist Cory Henry, vibraphonist Stefon Harris, keyboardist Cassandra O’Neal, and saxophonist Donny McCaslin. Learn more about our Artists-in-Residence program. 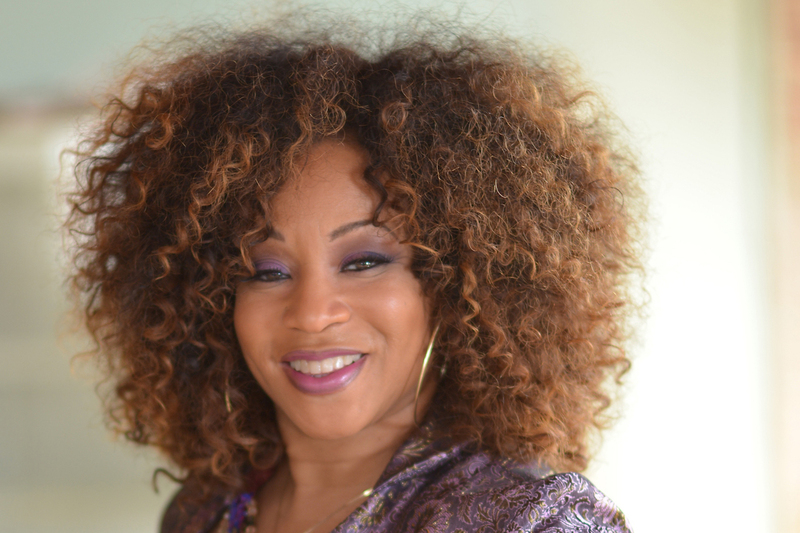 Cassandra O’Neal teaches her students lessons from more than 20 years of working as a musician alongside artists like Prince, Mary J. Blige, LeAnn Rimes, and Macy Gray. Columbia College Chicago’s Music faculty is a diverse group of professional musicians, renowned as composers, performers, and music educators. They have released solo recordings, written original compositions and arrangements, and toured with well-known bands. They are Grammy, Emmy, and Dove Award winners and nominees. In private lessons with them, you’ll hone your individual skills and techniques in your primary performance area and gain mentoring experiences essential to achieving your career goals. View all Music Department faculty. 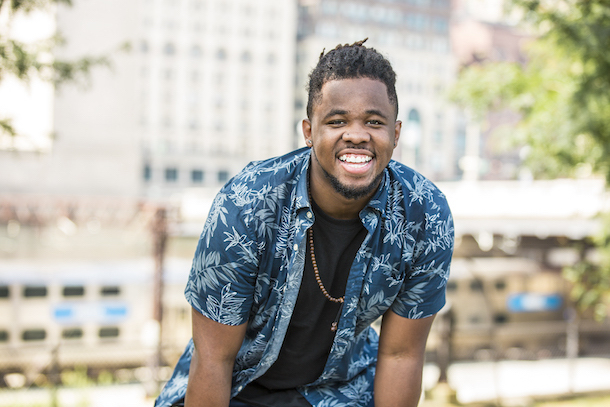 Charlie Curtis-Beard fosters his musical talents at Columbia College Chicago. With access to rehearsal space, concert halls, and recording gear, you’ll have the space and tools you’ll need to make your music. You can also rent professional equipment for your creative and artistic pursuits. Take a look at our music facilities. Many Music alumni work and perform together, building lifelong relationships and a strong Columbia presence in the Chicago music scene. Many alumni also mentor and collaborate with enrolled students. Music graduates are performers, composers, educators, and music business professionals. Many Music grads also have successful careers in other industries. Jonathan McReynolds ’11 is a Grammy-nominated and Dove Award-winning gospel vocalist and songwriter. Alicia Walter ’12 is a composer/songwriter and performer whose work was described as a “finely controlled art-pop explosion” by Wired magazine. Sarah Marie Young ’15 is a jazz singer-songwriter who won the Montreux Voice Competition judged by Quincy Jones. In 2017, she was featured with Postmodern Jukebox, and in 2018, appeared on Playing for Change’s “Skin Deep” video with Buddy Guy. Austin Deadman ’17 is a drummer and pianist and is a subbing percussionist for the Chicago production of Hamilton. Shi-An Costello ’10 is a pianist, composer, writer, and activist described by the Chicago Reader as “a precise, engaged, welcoming performer unafraid of deep ambiguities.” Shi-An’s music has been performed throughout Canada, the U.S., and Europe. Elizabeth Newkirk ’10 is the pianist in the duo Bow & Hammer, a classical group that renews excitement of chamber music by incorporating works from all musical eras. They started their own concert series in Chicago and were voted Best Classical Group in the Chicago Reader in 2016. Morgan Krauss ’12 is a composer pursuing a doctorate at Northwestern University for music composition. She has collaborated with orchestras and ensembles all over the world and is a two-time New Music USA Grant recipient. Many BA students explore other interests and broaden their career preparation by pursuing a minor. Our innovative Hip-Hop Studies minor will connect you with the local hip-hop community, and our Music Business minor will give you managerial and entrepreneurial experience. Some students explore other passions like cultural studies, photography, acting, or fashion.